In 1963, Jacques Demy set out to make people cry. Making only his second feature, and inspired by the emotional heft of 1961’s West Side Story, Demy set out to go that film one better, producing what is, I think, the first fully sung-through film musical. The plot of Umbrellas is kitchen sink realism, not far removed from Shelagh Delaney or Lynne Reid Banks. 17-year-old Geneviève Emery falls in love with local mechanic Guy, who is soon drafted (the film opens in 1958, at the height of the Algerian war), leaving her pregnant and living with her widowed mother above the titular umbrella shop. At the same time, Madame Emery is struggling to maintain the façade of gentility in the face of the slow decline of her business (this isn’t enormously surprising: the shop appears to carry only around five umbrellas at any given time and sells absolutely nothing else). While selling some of her jewels to pay a bill, mother and daughter meet Roland Cassard, a kindly, slightly dull but well-heeled jewellery dealer who falls in love with Geneviève. Isolated and miserable, Geneviève is drawn into a marriage with Cassard. The film ends in 1963 with a wealthy but clearly unhappily married Geneviève returning to Cherbourg to find Guy happily married. What sets the film apart, though, isn’t the story; it’s the performances, the songs, and the visual style. Geneviève is played by Catherine Deneuve, in her breakthrough and favourite role. Far from the icy detachment I’ve always associated with Deneuve, she moves here between incredibly charming giddy excitement during her romance with Guy and sulky teenage melancholy after his departure. Aside from the obvious, the most captivating part of her performance is that complete naturalism. Anne Vernon, in her sole really famous role as Madame Emery, has a much more difficult job. The key motor of the plot, she manages to drive a wedge between the two lovers while remaining completely sympathetic and charming. For much of the film she utterly dominates the screen, leaving the two lovers seeming callow and irrelevant. 39 when the film was shot, Vernon was clearly over the hill as far as the film industry was concerned and appears to have done almost nothing since. Some things never change. Nino Castelnuovo’s Guy, on the other hand, handicapped with the face of a Thunderbird pilot, is the weakest link in the ensemble. He is initially a blank canvas upon which Geneviève is reflected, but it’s on Guy’s return from the war that Castelnuovo’s really out of his depth. Before discussing the visual style of the film, it’s worth just looking at this gallery of screenshots hosted at blu-ray.com, both to get a sense of the beauty of the film and the quality of the restoration on the anniversary release. I said in the introduction that it’s a New Wave musical, and I don’t think I’ve ever seen a film as perfectly Pop Art as this. 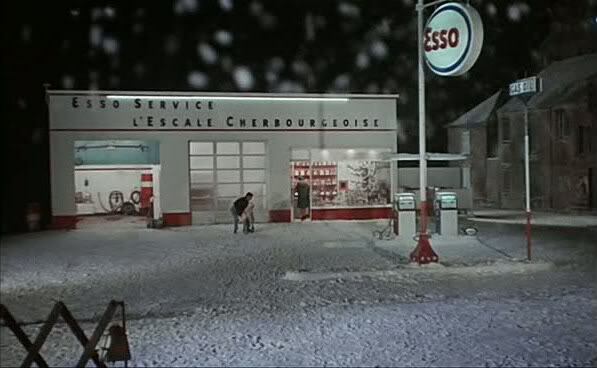 Demy’s Cherbourg is a sealed bubble, with every frame planned, every colour matching, from the rain soaked pavements of Act I to the snowglobe of Guy’s gas station in the finale. The film’s visual influence extends from Mad Men (check out Guy’s wife’s orange top in the screenshot gallery) to Absolute Beginners, but somehow Demy avoids the usual Pop pitfall: camp. The simple understatement of the story and the performances ground the film in genuine emotion. 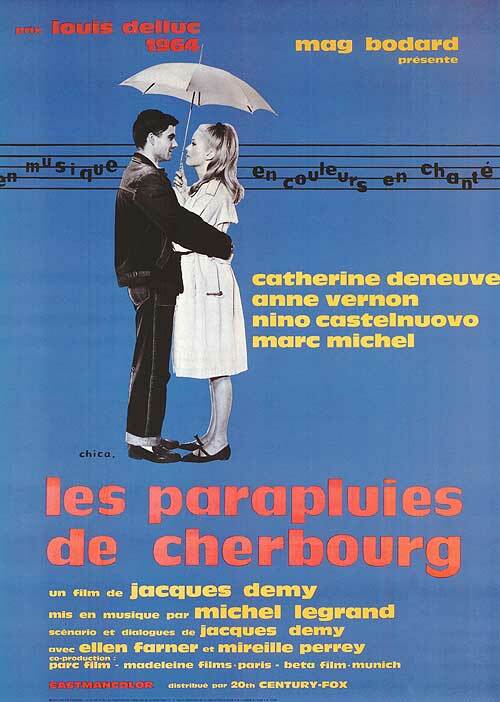 The anniversary edition includes a documentary, “Once Upon A Time … The Umbrellas of Cherbourg” which is worth watching if only for the interview with Michel Legrand at the piano. The documentary includes footage from the unrestored version of the film and demonstrates just how eyepoppingly good the restoration is. It’s a really lovely thing.